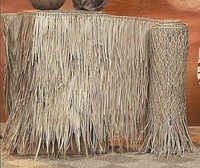 Description of Mexican Rain Cape Thatch Panel: Mexican Rain Capes make it effortless to convert ordinary structures into tropical island retreats with its shaggy fringe palm leaves roof thatch exterior and woven knotted interior. Mexican Rain Cape Thatch Panel Features: Versatile product; can be cut using scissors to any shape between the knots without unraveling. Like cutting a fish net. Palm branches for sale can be applied directly to batons for a more authentic look. Specifications of Mexican Rain Cape Thatch: Hand-woven palm leaf sheet is for 48" H x 20' W x 1" thick and weigh 44 lbs each panel. You get 1 long thatch roll for this price. Sold individually in one long thatch panel. Can measure up to 54" H x 22' W.
FAQs about Mexican Rain Cape Thatch: How long can I expect Mexican palm leaves roof thatch to last? Our palm leaves roof will last 5-6 years in dryer climates outside and indefinitely inside. Shop for Mexican thatches, Tiki hut roofs and other thatching materials online today!